It’s amazing what a difference can be made in a short space of time! Sometimes people put off making changes to things like bathrooms, thinking that it’s just too big a job that will cost too much and take too long. That’s why the old bathroom at this particular property survived so long! Austin Powers would have been proud of it! Big blue tiles, green painted walls, a fabulous orange carpet and a horrible old bathroom suite. But it had to go! Once our client took the plunge, it all happened very quickly. The existing boiler was a combination boiler that was in good repair and working well, so there was no need to change any part of the heating system or hot water supply. The property is three stories and the bathroom is on the top floor. We stripped out the old bathroom furniture and took it to a museum, then removed all the old tiles, old pipework and waste connections and safely disposed of them. We also collected the new tiles for the customer as she has no means of transport and the tile company was going to charge her for delivery. With the room now clear, we made good the walls and floor, ready for us to install and plumb in the new bathroom furniture and do the tiling. 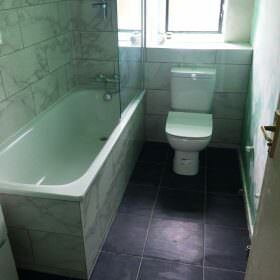 This particular bathroom had an internal soil pipe system which was boxed in, in the corner of the room. The old boxing didn’t fit with the new plan for the bathroom, so we changed the boxing, exactly as the client wished for, which has worked really well and given the room a much nicer feel. Next we installed the new bathroom furniture and did all the plumbing. Once it was in place and thoroughly tested, we did the tiling, which included the floor, the walls and around the bath and the boxing. The big, heavy tiles looked fabulous once in place. When the tiling was done, we set the hot water temperatures, did a final check and left our client wondering why she hadn’t done this sooner – just 5 days from start to finish!